If you’re looking for a quick, eye-catching Christmas card, look no further! Here is a design that you will enjoy making and you will be proud to give to friends and family. I decided to “shop” my stamp collection to choose the images for this card. There were three themes I wanted to include. The first was an abstract background that I could stamp once or twice. The second was a stamp set with great snowflake images. And, the third was a fun Christmas sentiment to match the overall design. Three stamp sets were used to create the card. The first is Love What You Do which has a great background stamp. The second stamp set is Colorful Seasons which is filled with amazing images for all seasons. And, the last is the Christmas Pines stamp set which includes great sentiments as well as wonderful images. “Shopping” your own stash can be a really fun way to pick images to use together to create new designs. This is a one-layer card with a Thick Whisper White card stock base. The base is cut to 5 1/2″ x 8 1/2″, scored at 4 1/4″ on the 8 1/2″ side. Use the background image from the Love What You Do stamp set and Pool Party ink to stamp the background image onto the front of the card. You can stamp the image either once or twice, as pictured. 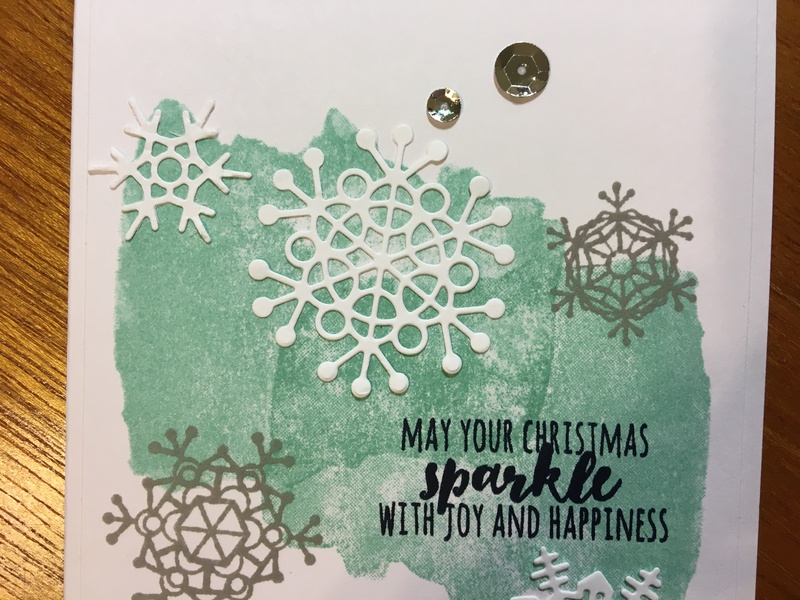 Use Gray Granite ink and the snowflake images from the Colorful Seasons stamp set to stamp snowflake images on the card front. Use Night of Navy ink and the pictured sentiment from the Christmas Pines stamp set to add a greeting to your card front, as pictured. 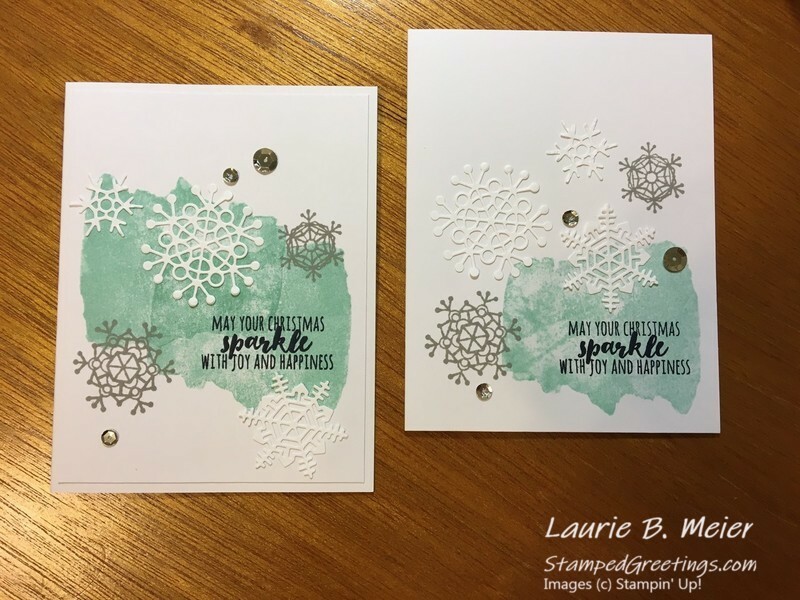 Die cut two or three snowflakes from Whisper White card stock with the Seasonal Layers Thinlits Dies collection. Adhere them to the front of the card to add dimension and interest to your design. The Fine Glue Pen works very well to adhere the die cut snowflakes. Add some bling to the card by adhering a few silver sequins. I used some sequins that I had leftover from a Paper Pumpkin kit. 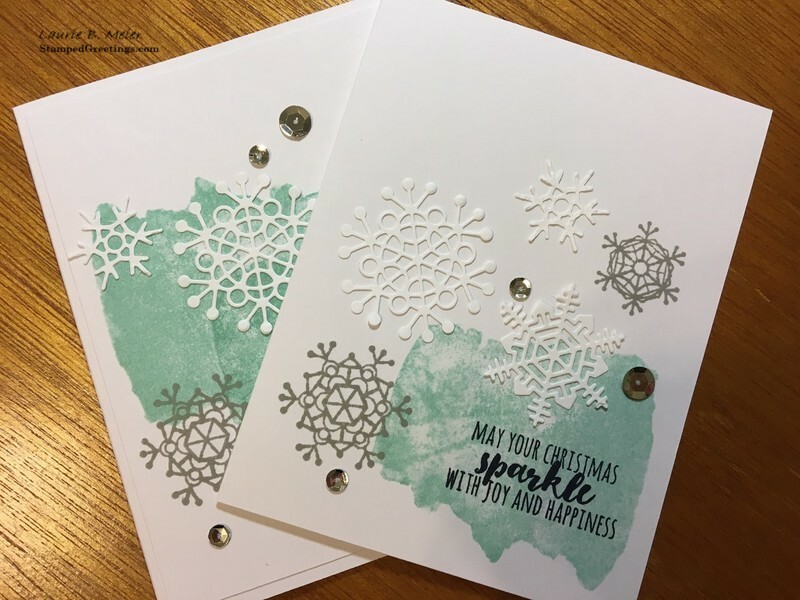 If you use your Stamparatus for the stamping, you will be amazed at how quickly you’ll be able to create a stack of these beautiful Christmas cards! Below are the main products that I used to create today’s card. If you click on any picture, you’ll go directly to my on-line store.